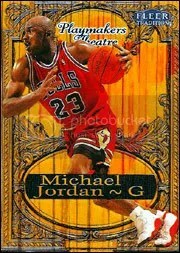 There is currently a 1998 Ultra Playmakers Theatre Michael Jordan from seller apdcards2011 that is already at $4,000. With 38 bids and 3 days left, I think we are set to see a record high price on this noteworthy card. The previous high that I’ve tracked comes from an October 2011 sale by firehorse9798. The buyer has not yet feedback on the October sale though, so it is still unconfirmed. The October sale was the first time this card cracked the $4,000 barrier and with now a second sale escalated past the four thousand dollar mark, it seems as if high dollar Jordan inserts are still appreciating. Stay tuned. This entry was posted on Monday, January 2nd, 2012 at 9:44 pm	and posted in NEWS. You can follow any responses to this entry through the RSS 2.0 feed.